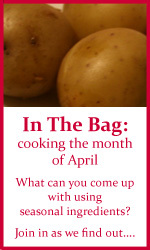 Did you see the round up over at Real Epicurean of March’s ‘In the Bag’ entries? There were some fabulous dishes made with one of my favourite vegetables, purple sprouting broccoli. It’s still in the peak of its season, so why not grab some and head over to the round-up for some inspiration? I’m already thinking of the possibilites. Now that the clocks have changed and the weather’s getting brighter these fresh ingredients will marry together perfectly for spring. As usual, to enter you just need to create a dish using these ingredients, then post about it on your blog or website and drop me an email. Enjoy!